Born December 1820 in Clare/Queens County, Ireland. Died after 1900 in New York. Perhaps immigrated to the US with his wife and 2 children before the 1850 US Census was taken. 1855 NYS Census: Thomas Brinan, age 30 (b. Ireland) and employed as a lumberman, was heading a household in Corning Township, Steuben County, New York. The household also included his wife, Mary Brinan, age 30 (b. Ireland); daughter, Catherine Brinan, age 8 (b. Ireland); son, James Brinan, age 6 (b. Ireland); son, John Brinan, age 4 (b. Steuben Co., NY); and son, William Brinan, age 2 (b. Steuben Co., NY). 1860 US Census: Thomas Brenan, age 37 (b. Ireland) and employed as a day laborer, was heading a household in Lindley Township, Steuben County, New York. His personal property was valued at $100. The household also included his wife, Mary Brenan, age 34 (b. Ireland); daughter, Cathrine Brenan, age 14 (b. Ireland); son, James Brenan, age 12 (b. Ireland); son, John Brenan, age 10 (b. NYS); son, William Brenan, age 8 (b. NYS); son, Thomas Brenan, age 6 (b. NYS); son, Abner Brenan, age 2 (b. NYS); and mother-in-law, Mary Doyd, age 66 (b. Ireland). 1865 NYS Census: Thomas Brinan, age 45 (b. Queens Co., Ireland) and employed as , was heading a household in Lindley Township, Steuben County, New York. The household also included his wife, Mary Brinan, age 39 (b. Queens Co., Ireland); son, James Brinan, age 16 (b. Queens Co., Ireland) and single; son, John Brinan, age 13 (b. Steuben Co., NY); son, Thomas Brinan, age 11 (b. Steuben Co., NY); son, William Brinan, age 8 (b. Steuben Co., NY); son, Albert Brinan, age 7 (b. Steuben Co., NY); daughter, Mary Brinan, age 4 (b. Steuben Co., NY); daughter, Ellen Brinan, age 2 (b. Steuben Co., NY); and mother-in-law, Mary Doyl, age 71 (b. Ireland). 1870 US Census: Thos Brinnan, age 50 (b. Ireland) and employed as a farmer, was heading a household in Lindley Township, Steuben County, New York. His real estate was valued at $2,500 and his personal property was valued at $1,000. The household also included his wife, Mary Brinnan, age 43 (b. Ireland); son, James Brinnan, age 20 (b. Ireland) and employed as a farmer; son, John Brinnan, age 19 (b. NYS) and employed as a farmer; son, William Brinnan, age 16 (b. NYS) and employed as a farmer; son, Thomas Brinnan, age 14 (b. NYS) and employed as a farmer; son, Abner Brinnan, age 12 (b. NYS); daughter, Mary Brinnan, age 10 (b. NYS); daughter, Hellen Brinnan, age 8 (b. NYS); and daughter, Margaret Brinnan, age 2 (b. NYS). 1875 NYS Census: Thomas Brennan, age 55 (b. Clare Ireland) and employed as a farmer, was heading a household in Lindley Township, Steuben County, New York. The household also included his wife, Mary Brennan, age 48 (b. Clare Co., Ireland); daughter, Mary A. Brennan, age 14 (b. Steuben Co., NY); daughter, Ellen Brennan, age 11 (b. Steuben Co., NY); daughter, Margaret Brennan, age 7 (b. Steuben Co., NY); son, Thomas Brennan, age 19 (b. Steuben Co., NY); son, Abner Brennan, age 17 (b. Steuben Co., NY); parent, Mary Doyle, age 83 (b. Queens Co., Ireland); and boarder, Sarah Doane, age 27 (b. Broome Co., NY). 1880 US Census: Thomas Brennan, age 60 (b. Ireland) and employed as a farmer, was heading a household in Lindley Township, Steuben County, New York. The household also included his wife, Mary Brennan, age 54 (b. Ireland); son, William Brennan, age 21 [quite legible; should be 24](b. NYS); son, Thomas J. Brennan, age 23 (b. NYS); daughter, Mary Brennan, age 19 (b. NYS); daughter, Ellen Brennan, age 16 (b. NYS); and daughter, Maggie Brennan, age 12 (b. NYS). 1900 US Census: Thomas Brinnen, age 79 (b. Dec 1820 in Ireland; parents b. Ireland) and employed as a farmer, resided in the household headed by his son, William Brinnen, age 44 (b. Sep 1855 in NYS; parents b. Ireland) and employed as a farmer, in Lindley Township, Steuben County, New York. The household also included Thomas's wife of 55 years (William's mother), Mary D. Brinnen, age 75 (b. Jan 1825 in Ireland; parents b. Ireland), who had had 9 children, 7 of whom were still alive; William's wife of 3 years, Emma Brinnen, age 24 (b. Aug 1875 in NYS; parents b. NYS); and lodger, Harry Brock, age 19 (b. Oct 1880 in PA; parents b. PA) and employed as a farm laborer. Born January 1825 in Clare County, Ireland; daughter of (?) and Mary (?) Doyle (b. abt 1792 in Queens Co., Ireland). a. Catherine Brennan: Born about 1846 in Ireland. b. James Brennan: Born about 1849 in Ireland. c. John Brennan: See generation 3, below. d. William Brennan: Born September 1855 in New York. e. Thomas J. Brennan: Born about 1854 in Steuben County, New York. f. Albert/Abner Brennan: Born about 1858 in Steuben County, New York. g. Mary A. Brennan: Born about 1861 in Steuben County, New York. h. Helen/Ellen Brennan: Born about 1864 in Steuben County, New York. i. Margaret "Maggie" Brennan: Born about 1868 in Steuben County, New York. Born about 1851 in New York. Employed as a farmer. 1880 US Census: John Brinnen, age 29 (b. NYS; parents b. Ireland) and employed as a farmer, was heading a household in Tuscarora Township, Steuben County, New York. The household also included his wife, Mary L. Brinnen, age 27 (b. PA; parents b. PA); daughter, Anna L. Brinnen, age 9 (b. NYS); son, James Brinnen, age 6 (b. NYS); son, Fred Brinnen, age 4 (b. NYS); son, Henry Brinnen, age 2 (b. NYS); and son, Abner Brinnen, age 4 months (b. Feb 1879 in NYS). 1900 US Census: John Brinnen, age 49 (b. Jul 1850 in NYS; parents b. Ireland) and employed as a farmer, was heading a household in Lindley Township, Steuben County, New York. The household also included his wife of 30 years, Mary L. Brinnen, age 47 (b. May 1853 in PA; parents b. PA), who had had 10 children, all still alive; Fred Brinnen, age 24 (b. Oct 1875 in NYS), single, and employed as a farm laborer; son, Erwin S. Brinnen, age 16 (b. Jun 1883 in NYS); son, Aurthur m. Brinnen, age 15 (b. Apr 1885 in NYS); daughter, Ruby M. Brinnen, age 11 (b. Aug 1888 in NYS); daughter, Jessie E. Brinnen, age 7 (b. Jun 1892 in NYS); and daughter, Mary G. Brinnen, age 4 (b. Nov 1895 in NYS). 1910 US Census: John Brennan, age 58 (b. NYS; parents b. English-speaking Ireland) and employed as a farmer, was heading a household in Lindley Township, Steuben County, New York. He had been married once. The household also included his wife of 40 years, Mary L. Brennan, age 56 (b. PA), who had had 10 children, 9 of whom were still alive; son, Arthur M. Brennan, age 24 (b. NYS), single, and employed on the home farm; daughter, Ruby M. Brennan, age 21 (b. NY) and single, with no employment recorded; daughter, Jessie E. Brennan, age 17 (b. NYS) and single, with no employment recorded; daughter, Mary G. Brennan, age 14 (b. NYS); and servant, Fred Walker, age 34 (b. NYS). 1920 US Census: John Brennan, age 67 (b. NYS; parents b. Ireland) and employed as a farmer, was heading a household in Lindley Township, Steuben County, New York. The household also included his wife, Mary L. Brennan, age 66 (b. PA; parents b. PA); son-in-law, Orsan W. Bronson, age 23 (b. NYS; parents b. NYS) and employed as a machinist in a shop; daughter, Jessie E. Bronson, age 27 (b. NYS; father b. NYS; mother b. PA); and grandson, Wendell Bronson, age 1 year and 1 month (b. NYS). Born about 1854 in Pennsylvania. a. Anna L. Brennan: Born about 1871 in New York. b. James Brennan: See generation 2, below. c. Fred Brennan: Born about 1876 in New York. d. Henry Brennan: Born about 1878 in New York. e. Abner Brennan: Born February 1879 in New York. f. Arthur M. Brennan: Born about 1886 in New York. g. Ruby M. Brennan: Born about 1889 in New York. h. Jessie E. Brennan: Born about 1893 in New York. i. Mary G. Brennan: Born about 1896 in New York. Born November 1873 in New York. Employed as a farmer. 1900 US Census: James Brinnen, age 26 (b. Nov 1873 in NYS; father b. NYS; mother b. PA) and employed as a farmer, was heading a household in Lindley Township, Steuben County, New York. The household also included his wife of 5 years, Bird Brinnen, age 28 (b. Jul 1871 in NYS; parents b. NJ), who had had 2 children, both still alive; daughter, Susie B. Brinnen, age 3 (b. Jul 1896 in NYS); son, Harlo E. Brinnen, age 2 (b. Oct 1897 in NYS); and servant, Curtis Dunning, age 19 (b. Dec 1880 in NYS; father b. NYS; mother b. NJ), single, and employed as a farm laborer [Bird's brother]. 1905 NYS Census: James Brennen was heading a household in Lindley Township, Steuben County, New York. 1910 US Census: James Brennan, age 35 (b. NYS) and employed as a farmer, was heading a household in Lindley Township, Jefferson County, New York. The household also included his wife, Birde Brennan, age 37 (b. NYS); daughter, Susie B. Brennan, age 13 (b. NYS); son, Harlow E. Brennan, age 12 (b. NYS); and brother-in-law, Curtis Dunning, age 27 (b. NYS). 1915 NYS Census: James Brennen was heading a household in Lindley Township, Steuben County, New York. 1920 US Census: James Brennan, age 46 (b. NYS; father b. NYS; mother b. PA) and employed as a farmer, was heading a household in Lindley Township, Steuben County, New York. The household also included his wife, Virde Brennan, age 48 (b. NYS); daughter, Susie B. Brennan, age 23 (b. NYS); and son, Kermit J. Brennan, age 5 (b. NYS). 1925 NYS Census: James Brennen was heading a household in Lindley Township, Steuben County, New York. 1930 US Census: James Brennan, age 57 (b. NYS; father b. NYS; mother b. PA) and employed as a farmer, was heading a household on West River Road in Lindley Township, Steuben County, New York. He was married 1st at age 22. The household also included his wife, Birde Brennan, age 58 (b. NYS; parents b. NJ), who married 1st at age 22; son, Kermit J. Brennan, age 15 (b. NYS); and brother-in-law, Edgar Dunning, age 69 (b. NJ; parents b. NJ), widowed, and not employed. Born about 1872 in New York. Died 1950; interred Fairview Cemetery, Lindley Township, Steuben County, New York. a. Susan "Susie" B. Brennan: Born about 1897 in New York. b. Harlow E. Brennan: Born about 1898 in New York. c. Kermit James Brennan: See generation 1, below. Born 28 October 1914 in New York. Died 18 January 1987; interred Camptown, Bradford County, Pennsylvania. 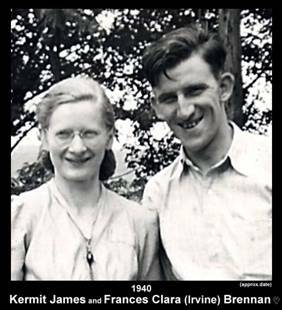 Married Frances Clara Irvine, descendant # 1.1 of generation 6 of the Descendants of John Milton Irvine, on 1 September 1940. 1. Susie Brennan: (more info) Was the school teacher for Christine (Irvine) Biles from 1901 to 1902 at the Homets Ferry School.